Although lately, we have been hearing from a broad spectrum of the media about the wide influence of the Muslim Brotherhood throughout the Middle East, serious discussions about the Brotherhood inside America are few and far between. This weekend, one of the South Asian leaders of the group will be a featured speaker at an Islamic convention held in Connecticut - a prime example of the reach this extremist movement has within our borders and how American Muslim organizations are partnering with it. The media's reporting of revolutions taking place in various Middle Eastern nations has raised concern about the potential for the Muslim Brotherhood (MB) – or Ikhwan al-Muslimun – to gain power within these nations, specifically Egypt, where the global headquarters of the Brotherhood is located – a concern that is warranted, as the Brotherhood is responsible for the emergence of a number of terrorist movements around the globe, including Hamas and al-Qaeda. This concern has also brought a newfound awareness of the Brotherhood for Americans, who previously might not have heard of the group. What many Americans still are ignorant of, however, is the fact that the group has a fairly large presence inside the U.S., where many Brotherhood entities operate under the guise of "civil rights" organizations. Contemporary U.S.-based groups such as the Council on American-Islamic Relations (CAIR) and the Islamic Society of North America (ISNA) have their beginnings in the Brotherhood. The Muslim Students Association (MSA), with chapters in most of, if not all of, the universities throughout the country, was the first major Brotherhood group in the U.S. Further, the North American Islamic Trust (NAIT) owns the properties of hundreds of Brotherhood-oriented mosques and Islamic centers. Another Brotherhood organization – one of the largest within the United States – is the Islamic Circle of North America (ICNA). Started in the late 60s and early 70s, ICNA began as an American arm of Jamaat-e-Islami (JI), the Muslim Brotherhood of Pakistan. 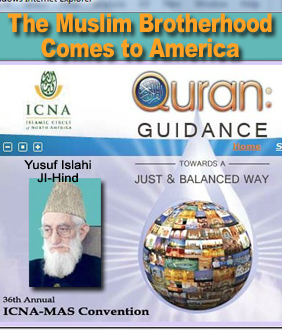 Beginning on May 28th, 2011, along with its event partner, the Muslim American Society (MAS), ICNA will be holding its 36th annual convention, entitled "Quran: Guidance Towards a Just and Balanced Way." The event is scheduled to take place at the Connecticut Convention Center in Hartford, Connecticut. According to ICNA's website, featured as speakers at this year's event will be a number of Islamic radicals. These include Siraj Wahhaj, a government-named "unindicted co-conspirator" for the 1993 World Trade Center bombing, and Jamal Badawi, whose work, Gender Equity in Islam, justifies wife beating. Another of the scheduled speakers is Yusuf Islahi, whose involvement with ICNA is substantial. In addition to speaking at ICNA functions, Islahi has been the Chief Patron of ICNA's Islamic outreach (dawah) faction: Why Islam (WI). Moreover, until recently, Islahi's personal website, farrukh.net, was the Registrant for ICNA National's official site. Islahi has also been directly involved with Jamaat-e-Islami as a member of its Central Advisory Council, the Markazi Majlis-e-Shoora, of the JI-Hind, the Indian branch of Jamaat-e-Islami. In this position, he is currently serving his fifth term -- someone involved in both the Muslim Brotherhood overseas and here at home. While the ICNA event will most probably get news coverage, it is likely that no mention will be made in the media of the Brotherhood or ICNA or Islahi's association with it. These will, in all likelihood, be ignored, as they have been so many times in the past; and America's citizens will remain uninformed and oblivious to what is happening around them and the threat they face. If the Brotherhood has been responsible for the emergence of terrorist movements around the globe, why do we believe that cannot happen here at home? It may take an American Islamic revolution for the reporters to snap out of their political correctness-induced comas and begin to discuss who is really behind these "conventions" – the Muslim Brotherhood. Though, by then, it will be too late.